Bonsai (n/a): growing, planting, caring. This description is for bonsai kept indoors. 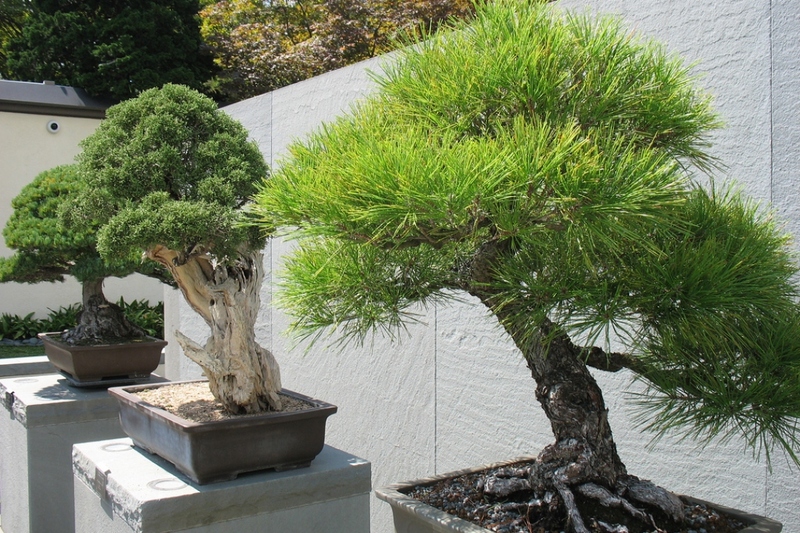 Many plants can actually be grown as bonsai. This is a description for those that are better be kept outdoors. The most suitable species are Olive (Olea europea), Pomegranate (Punica granatum), Fuchsia (Fuchsia), Chinese elm (Ulmus parvifolia), Mulberry (Morus), Cork oak (Quercus suber), Chinese troll (Ligustrum sinensis), The web maples (Acer palmatum) and the Buerger maples (Acer buergerianum) need a winter dormancy, so they need cold several months of the year. Do not feel limited by these species, there are bonsais from yew or charm! Ficus are a genus in the Moraceae family including trees, shrubs or lianas. Ficus microcarpa is recognized by its small, evergreen, ovate, pointed leaves and aerial roots, which easily merge with the trunk. These tropical plants produce particular inflorescences and infructescences, the sycones or figs: Ficus in Latin, is the fig tree! Ficus microcarpa likes warm and rather dry atmospheres: it adapts rather well inside our houses and our apartments. It needs light during the winter, so place it near a window. If it is in bonsai shape, plant it in a pot barely larger than its current container. Bonsai aficionados usually mix equal amounts of pozzolana, potting soil, pumice stone and sifted akadama to remove the finer parts. These two last ones can possibly be replaced by chippings and litter for cat ... It will appreciate a draining soil, moderately rich, like potting soil for indoor plant. Avoid tanks with water reserve: the roots of ficus do not support to be constantly in the water. As soon as the soil becomes dry on one centimeter, water so as to moisten all of it. During the growth period (spring, summer), watering should be regular - once or twice a week - but measured in order not to asphyxiate the roots of plants. In the fall, space the waterings gently, until winter. The maintenance pruning is to be done at least three times a year: Cut with suitable scissors all the branches that protrude from the silhouette. That's all ... A mandatory pruning to do each year between in March or in October, for the ficus you want to keep in bonsai. Use clean bonsai scissors. Start by removing the branches that grow along the trunk, to get transparency at the base of your ficus. You can leave the aerial roots, however, because they will give with the years a "mangrove" look to your bonsai. Make a selection among the branches to lighten your ficus a little, remove those which come back inside, and those which have died. Then comes the more delicate step: prune, 1 mm above the leaf, each branch so that only 2-3 leaves are left. Choose the last leaf that you keep according to its orientation. It must imperatively be oriented towards the outside of the plant, otherwise the branch which will be formed starting from the bud located at its base will come entangled. From spring to fall, add bonsai fertilizer on a regular basis. Follow the instructions marked on the package, the dosage and rhythm depending on the one you use. You can also add slow release fertilizer pellets to the soil mix when planting or repotting. Stop all fertilizer treatments at the end of summer. At the end of the winter every 3 or 4 years, repot your ficus! You can also repot before, especially if the pot falls and tilts easily: this is the sign that your ficus is too cramped! Choose a pot size barely larger than the old one, composed of terracotta, with a drilled bottom. Sprinkle the original pot, add small stones or clay balls for drainage into the new pot, and add potting soil mixed with some garden soil. Fill until it reaches one third of the pot. NB Bonsai aficionados usually mix equal amounts of pozzolana, potting soil, pumice and sifted akadama to remove too thin parts. These two last ones can possibly be replaced by chippings and littered cat litter ... Unpot, unclamp the roots, position the mound on the potting soil, and fill. Tamp rather strongly, and water! If your plant is sick, stop adding fertilizer. If you suspect the presence of parasites, refer to the species description, which is more precise.